Like anyone in the hospitality business, we strive to bring you, our customers, the best which is why you may find that things are looking different. 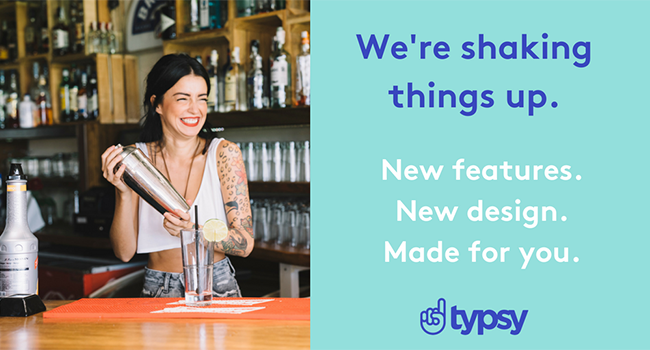 Over the past few months, we’ve planned, designed, tested, stayed up late and had one too many coffees, all to bring you a new and improved Typsy experience. We promise it's been well worth it! From start to finish, we’ve had one goal in mind – ensuring the Typsy platform is easy to use and accessible as possible. In fact, you'll find that Typsy runs smoother and faster than ever! Easy sign up. Just fill in our sign up form, confirm your email address and you’re ready to go. As a Manager on Typsy's platform, training your staff and students just got a whole lot easier with our 'Quick Training' and 'Detailed Training' options. Whether you are on your phone or using a computer, you can now assign training anywhere, anytime. Browse our content library and select the lesson or course you'd like to instantly assign to your Members. It's that simple. You also have the option of adding each individual lesson or course to your 'Favorites' or to a 'Playlist'. Favorites is an easy and super quick way of saving any content, including your own, that you regularly use, or like on the Typsy platform. Like a course or lesson, such as Food safety and hygiene, but want to view or remember it for later? Add it to your Favorites and it will be ready when you need it – kind of like that online shopping ‘wishlist’ you keep adding items to. Playlists allow you to easily mix and match one or more of our lessons and courses into a collection to assign to your Members whenever you need. For example, if you constantly use induction training content, just create an 'Induction' Playlist and add all the content you need, then assign it. Too easy! We've also put our heads together and done all the hard work for you to bring you our Typsy curated Playlists. These are a selection of our suggested lessons and courses that we think you'll find most useful for your Members. Just add them to your own Playlist selection so you can get started on training your staff quicker. Want to go more in-depth with your training? Just use our 'Assign Training' option and you can choose individual lessons or courses, or a whole Playlist to assign. This option also allows you to choose which Members, Venues and/or Roles to assign training to, set a 'Due date', set the training as 'Required' and set the training to 'Automatically assign' to new members within your organization. Typsy's updated platform hasn't just had a facelift. We've designed it so you can customize Typsy to your business or school location. With our Members based all over the world, we've made it easy to tailor assigned content to your location. Set a time zone for your business or school and anything you assign will be tailored to your local time zone. Now your Members will always have their training completed on time. Some of our Members have multiple venue types which is why we've added a new 'Venue type' function. Choose the 'Venue type' (e.g. Hotel, Cafe or Wine Bar) when you add or edit a venue in your organization and Typsy will soon start to recommend the best training for your Members. 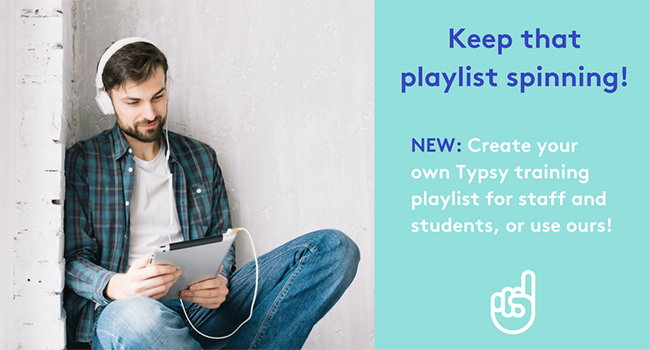 Updating staff and students on your news is easy with Typsy notifications. You can continue to easily send messages to your Members to keep them updated on what's happening within your organization, or just send a Member a quick hello or congratulations on a job well done. Typsy is visual and we know that visuals are one of the best ways to understand and learn. That’s why our Member and Manager dashboards have had a huge redesign. 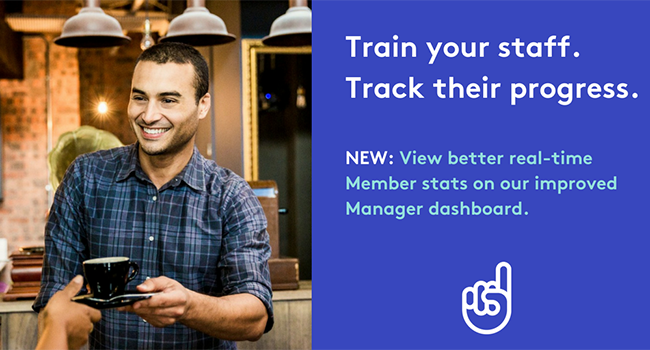 The dashboard is now an easy place to see an overview of your Members' or organization's overall training. For Members, there are now new ways to view the number of lessons and courses you’ve completed, plus stats to show how you’ve been tracking across days, months and your whole time with Typsy. You’ll also see how you compare to other Members within your organization and the number of Skill Credits you’ve earned across all subject areas. We’ve broken things down even further, so Managers can see how all Members within your organization are tracking. Now you can view how many Skill Credits your Members have, how many are engaged, how many have completed training and other important information. To delve deeper, just click on the appropriate option to view in-depth 'Reports' on all your Members. Managers can now drill down into how their Members are tracking with organization 'Reports'. View your Members as a whole and spot training trends, the number of lessons watched, training hours completed, leaderboards and more. Reports are accessible from your Dashboard and via export, so you can access all the information you need, anywhere. As Typsy grows so will our Reports, expect to see more in-depth information soon. Creating a Typsy account just got easier! Our new simplified process means you can start training quicker than ever. Just fill in our sign up form, confirm your email address and you’re ready to go. Businesses and Academic account holders no longer have to worry about paying for Member accounts they don't need. Each Member who joins Typsy will use a ‘license’ through your organization. The more licenses you have the more Members you can add. Plus, you can even remove licenses when your staff or student numbers decrease during off-peak periods and school holidays. Once you've created your Typsy account you can then associate your LinkedIn, Facebook, Google or Microsoft account. Just login to your Typsy account with the email address you used to create your account, go into 'Manage your account' and then register the 'External & Social logins' you need. Don't forget that you can also share your Typsy profile and any Certificates you earn on your social media accounts, including LinkedIn, Facebook, and Gmail, to let your friends know how you are tracking on Typsy. keep learning, no matter what language they speak. 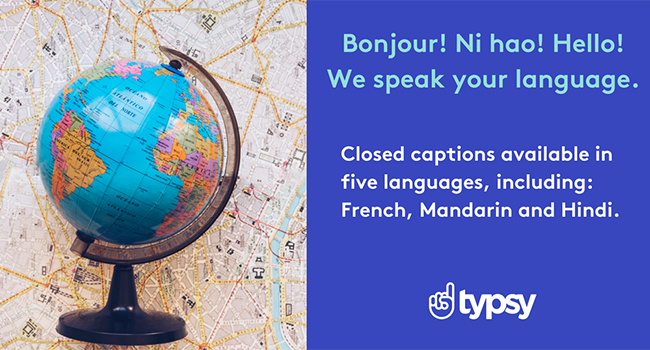 Don't forget that we offer all of our courses, lessons, and mentor sessions with closed captions in five different languages. There are more than 100 different currencies across the world, so it makes sense to offer our plans in your local currency. Based in Australia? You’ll be charged in AUD. Based in the UK? You’ll be charged in GBP. Simple! Whether you just want to learn new skills or train your staff in minutes, our Typsy platform is ready to help you on the road to success. What are you waiting for? It's up and live now! 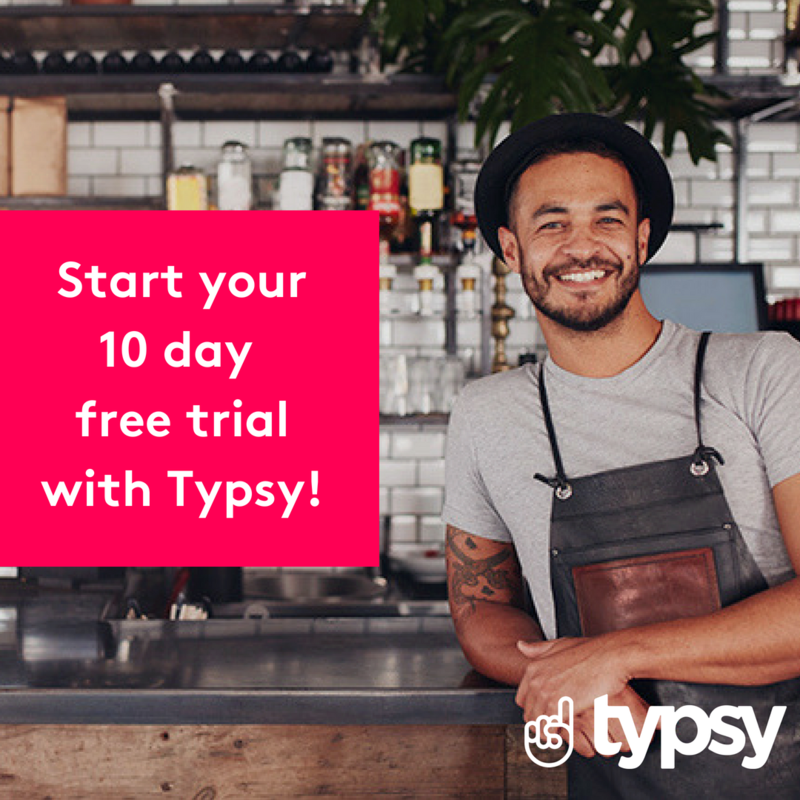 Join the Typsy Tribe today with our 10-day free trial. If you have any queries regarding our new features or require support, contact us today.